Walnuts. Sugar. That’s pretty much all you need to make candied walnuts! A dash of salt helps too. These are very easy to make. The trick is to work very fast once the sugar starts melting, because once you mix in the walnuts, the candy syrup cools quickly and the walnuts will stick together. You have 30 seconds or so to separate them before they are forever bonded by glassy, cooked sugar. Around the holidays, candied walnuts make a great party snack. You can make them a day or two ahead, and then just set them out in small bowls or serve them alongside a cheese plate for people to snack on. You can even add a sprinkle of minced rosemary or a dash of cinnamon when you stir in the walnuts for some extra holiday flavor! Other times of year, candied walnuts are a fine addition to lunch salads, mixed into bowls of yogurt, or sprinkled over ice cream. They’re also a convenient snack to have in your bag when traveling. Don’t like walnuts? Use pecans, almonds, or any other nut instead. You can also double this batch if needed, though your sugar will take a little longer to caramelize. If you need to make more candied nuts, make them in separate batches rather than trying to make them all at once; it’s more difficult to quickly separate larger batches before the caramelized sugar starts to harden. Let your walnuts cool completely, then store them in an airtight container, like glass canning jar, at room temperature. As long as it’s not too humid where you live (which will cause the walnuts to become sticky), they should stay crunchy for at least a week. Looking for more ideas for nuts? Updated December 21, 2018 : We spiffed up this post to make it sparkle! No changes to the recipe. 1 Toast the walnuts: Preheat oven to 350°F. Use middle rack in oven. Lay walnuts out on a baking sheet in a single layer. Bake for 5 minutes, until slightly darker in color and fragrant. If not quite toasted enough, toast for 1 or 2 more minutes. Be careful not to burn. Remove from oven and let cool in pan on a rack. 2 Get everything ready: You'll need to work quickly once the caramelized sugar is ready, so be sure to have everything prepped and ready to go. Place the cooled walnuts in a bowl near the stove. Line a rimmed baking sheet with a silicon baking mat or parchment paper and place near the stove. Have two forks ready. 3 Caramelize the sugar: Pour sugar into a medium saucepan with a thick bottom and place over medium heat. Stir with a wooden spoon as the sugar begins to melt. Keep stirring until all the sugar has melted and the color is a medium amber, 5 to 10 minutes (exact timing will depend on your stovetop). 4 Coat the walnuts in caramelized sugar: As soon as sugar has melted and the color is a medium amber, add the walnuts to the pan. Stir quickly and make sure each piece is coated with the sugar mixture. As soon as the walnuts are coated with the sugar mixture, spread them out on the rimmed baking sheet. Use two forks to separate the walnuts from each other, working very quickly. Sprinkle the nuts with the salt. 6 Cool and store: Let the walnuts cool completely. Transfer to an airtight container and store for up to a week. Hello! All photos and content are copyright protected. Please do not use our photos without prior written permission. If you wish to republish this recipe, please rewrite the recipe in your own unique words and link back to Candied Walnuts on Simply Recipes. Thank you! I made this recipe twice. The sugar melted. I added the nuts. Stirred. Then I put them on the parchment covered pan and began separating with 2 forks. The nuts broke as I separated them and the end result looks like a mess. You can’t even tell they are walnuts. Not worth the trouble. In my experience, the only way to get nice looking walnuts coated is to dip them into the melted sugar one at a time and place on parchment. So sorry this didn’t work for you! I bet you can still put them on top of ice cream or use them in some way where the aesthetics aren’t as important? I was using these with a raspberry salad so I add 1/8 tsp raspberry emulsion to sugar and it had just the right hint of raspberry taste to compliment salad as a whole. If I didn’t want raspberry… I’d likely add vanilla also. Hi Dawn, great idea! We blanched walnuts for another recipe recently and you’re right, blanching takes away the bitterness. It’s the tannins that make walnuts bitter (and cause staining) so apparently blanching works to remove them from the walnuts. Great tasting simple recipe! We followed the recipe and then we sprinkled cinnamon on top to add extra flavor. It was gone in minutes. I made candied walnuts many years ago but the recipe was so complicated and the oil started to burn and smoked up the whole house. This looks way too easy…love it! So tonight we are having roasted beet salad with candied walnuts and goat cheese. I’m thinking of using brown sugar rather than white sugar. No idea how I’m going to cook the chicken, yet! Just tried this for the first time, to put into a salad with cranberries and apples I am making for a NYE party. I can mess anything up but these seemed to have turned out OK! I used my toaster oven and toasted the walnuts in batches, just in case. This only became problematic because I forgot to reduce the sugar for fewer walnuts, so the first batch came out very sugary! But so yummy. The second batch was better. The only problem I found is that the sugar tends to harden on the wooden spoon so I would recommend using a plastic spatula which seemed easier to get the hardened sugar off of, and also when left over residual sugar hardened in the pan, that was a bit of a pain to get off. But all in all these are so good and I’m so glad I know how to make candied walnuts now! The hardest part is not eating them all before putting them into the salad! I definitely do not recommend a plastic spatula, which will most likely melt at the very high temperatures of the melted sugar. To get the sugar off of the wooden spoon, just soak it in water for 10 minutes. Yes, the residual sugar can harden like cement. But just soak it for 5 minutes or so in hot water and it dissolves. Yesterday, I gathered a huge bowl of walnuts from our tree. Today, we shelled the nuts and made the recipe. Worked perfectly. YUM!!! Just made these 5 minutes ago. So quick and easy. I followed directions exactly but used a silicone spatula to stir cause I don’t have a wooden spoon. Serving these on a summery salad tonight. Yum! Any tips on clean up? Otherwise, worked out pretty well for a first timer, except forgot the salt. I used turbinado (Sugar in the Raw) so it was amber right from the start, and might not have waited quite long enough- didn’t get even coating, but hey, they taste awesome. Hi Dave, sugar is beautifully water soluble, and so is caramelized sugar. All you need to do is soak the pan/cooking implements in water long enough. Hot water will speed things up, I usually start with hot water and soak for several hours. I have never candied anything before, but I followed the recipe to the letter, and it worked wonderfully. Thank you so much to everyone else for all the tips. I also sprayed the paper with a bit of oil to stop them sticking. Might try butter next time. They taste DIVINE! I had walnuts at home from many days. Didn’t know what to do….. Today I thought of doing something with them and googled walnut recipes…. But , It came out very well and sugar didn’t burn….. I used alluminium foil greased with butter for spreading the sugar coated nuts. Adding Salt increased the taste of it and it was really a great and easy recipe…. I just made these a few minutes ago and followed the recipe exactly. They were DELICIOUS! I doubled the recipe and toasted the walnuts for 6 minutes. I used a medium saucepan at medium heat (no higher) and lowered it once almost all of the clumps had melted. The sugar got very clumpy at first, but then it all melted and became amber just like the directions said. The clumps ALL melted out – it just took a little time and patience. This was awesome. I had no issues. I didn’t have an appropriate sized saucepan with a thick bottom so I used my good heavy 10″ frying pan and it worked just fine. People who are freaking out about clumpy sugar probably weren’t patient enough. Just stir it until it all melts then throw in the nuts. Easy. I didn’t have fancy parchment paper so I just threw the nuts on aluminum foil and they didn’t stick to it. for those that are having trouble with the sugar recrystallizing on you, it’s because you’re stirring too much. If you have any left over sugar crystals on the side of your pot / wooden spoon, you can reintroduce the crystal structure back into the already melted sugar, and they form crystals again. 1) Use a big enough pan – 2-3qt. A little sauce pan won’t cut it. 2) Stir, turn it on medium heat (medium high if you know what you are doing). 3) Keep stirring, do not add anything. You’ll see the sugar start to look like clumpy sand. 4) You’re close…you’ll see part of it start to melt. Now is where it’s important to bring the edges into the middle. Keep stirring, the lumps will go away. 5) It will look like a light pancake syrup. Add your toasted nuts and stir quickly, and completely. 6)Don’t panic if they are all sticking together. Use a forks and break them apart. 7) DO NOT USE WAX PAPER — It melts and is hard to work with. Parchment paper is the best. Note: For the past 15 years, I have added a little nutmeg, cinnamon and chile powder. Great flavor. You can also zest a little orange peel. I’ve wanted to make candied walnuts for some time. I found your recipe. The fewer ingredients and steps, the better. It was so easy. I added a touch of cinnamon, nutmeg, and cayenne pepper into the sugar. They came out so light and crispy. I gave some to a neighbor and told her they’d be good on salads. As she was eating them, she said, “No they won’t. They won’t get that far.” That said it all. They are great! I have been looking for a candied walnut recipe that uses liquor. I’m not sure if it is Rum or something else. I remember having them when I was a young child at Christmas time and they were awesome. Does anyone have a recipe like that? 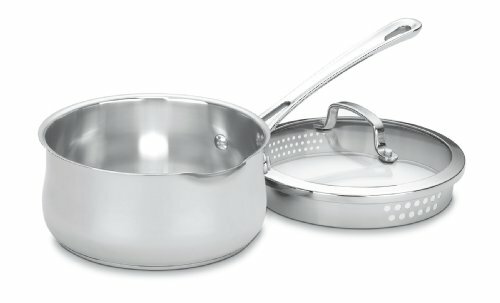 I don’t have a pot with a particularly thick bottom- how problematic is this? It’s a problem because then the sugar might not melt or caramelize evenly. You could more easily end up with burnt sugar. One important tip when doing this is DO NOT put the candied nuts on WAX paper. The sugar temp will be way in excess of what wax paper can handle. The nuts will become fused to the paper and there’s no way to get them off, without the taste of crayons and the occasional bit of paper. Use parchment paper instead! It can handle the heat. Learned this the hard way! I just tried these for the first time. I was about ready to call it quits (I had the melting and clumping that some other posters have described) but I just kept stirring and it eventually happened! The sugar completely melted…I added a bit of pumpkin pie spice and they are really good. There was a bit of stringing between the nuts as I separated them on the baking sheet…I assume this is normal or does it mean that I didn’t cook the sugar long enough? Regardless they taste just fine and will be awesome on salad (along with craisins and a raspberry vinaigrette). So glad it worked out for you! And yes, the stringing is normal.